Neilly, Muriel. February 6th 2019. Peacefully at her home in Bangor. Much loved mother of Stuart, Scott and Adam. Service in Roselawn Crematorium on Monday at 3.00pm. Family flowers only please. 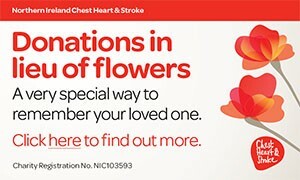 Donations may be sent if desired to Marie Curie c/o S. Clarke & Son, Funeral Directors, 64 Newtownards Road, Bangor, BT20 4DR. Will be sadly missed and lovingly remembered by her sons and all the family circle. I am sorry to tell you that Muriel Neilly has passed away.